"Nat initiated his 17 years of creating albums with a session devoted to the most focused work at the piano that he had yet committed to commercial record." For what seems to be the first time, on August 13th 1947, Nat approached a session with the specific intention of producing a set of tracks to be sold as a single work. While he would eventually move millions of albums as a vocalist, Nat initiated his 17 years of creating albums with a session devoted to the most focused work at the piano that he had yet committed to commercial record. There is not one vocal among the eight tracks comprising King Cole At The Piano, each instead consisting of instrumental solo piano backed only by his Trio-mates, Oscar Moore on guitar and Johnny Miller on bass, in supporting rhythm roles. Bob Dylan had a keen comment about Paul McCartney which went to the effect of, "Every word that comes from his mouth is framed in melody." Likewise for Nat, as his vocals and piano alike are innately melodic. While Nat is clearly not limited to a Trio context in order to create at the keys, it may be interesting to note that without the Trio interplay and structures, Nat proceeds to regularly insert counters and reassert phrases as if providing his own accompaniment and foils. Yet no matter how the worm turns, in the parlance of the time, the melodic currents still flow inevitably through each piece. The focus of this project clearly rewarded with a remarkable coherence through each track. Wonderful examples of jazz musicianship abound. But there has been some criticism that while his playing is technically amazing, it is emotionally rather cool and aloof. My initial reaction to playing this set reflected that impression a bit. As I've come to know it better, it has became apparent that I wasn't quite tuned in to how he does express himself at the keyboard. Nat isn't the sort to be as intensely demonstrative as some considered as more "emotionally expressive" are. Instead he is at once candid and wry in his proclivity to circumspection, his feelings gently expressed in his own somewhat shy, whimsical way. Also, the commitment obvious in his performance quality seems to be taken for granted at times as well, perhaps a consequence of the level of his mastery making his playing seem to be far easier than it is. Recurring themes in this set from an emotional standpoint are contrasting senses of freedom and wistfulness. A personal expression of his situation in his life at that time (1947) peeking out, or merely themes which lent themselves to this then-atypically self-focused work? We may never know, and it isn't as if we have many such projects from him to provide much context to begin with. Regardless, there are feelings to be found between the lines. My favorite in this set is the gripping Blues In My Shower. Sure fingered strong notes and ruminating tinkling run on throughout like thoughts you just can't get rid of, even in the friggin' shower. The medium-slow foot-tap tempo is also wonderful, a great contrasting physical activity to the mental musical notions. Easily deserves a spot among his greatest ever piano works. Three Little Words has the uncanny distinction of featuring on both his first and last albums. Dazzling gleams from the chrome of superbly placed trim upon notes polished by his exquisite "touch" on the keys ripple across much of his work. This is no exception. And dog-gone it can stick in the head, piano or vocal. Moonlight In Vermont is a lovely evergreen as a slow-tempo song, but the focus here is strictly musical. Among a number of ideas, Nat seems to particularly enjoy stepping on a higher note every other step here and there. The descriptive Poor Butterfly begins with a delicate mood sustained through a rather nice melodic piano-only intro, segueing into a solid tempo for Nat to improv with a relatively restrained feel, capped by the tempo segueing gracefully into a turning current that seems to blow us to a final rest. How High the Moon was a staple of jazz for many years. Nat plays with its grand phrases like so much sand in a sandbox at one turn and "sings" brightly at another turn. I'll Never Be the Same seamlessly blends a wonderful freedom with a sometimes strong wistfulness, perhaps most distinctly embodying the root themes of the set. A certain frustration is periodically present among the reflective calm of These Foolish Things. At one point he reflects its climbing intensity with one single travel up to the thin keys, and having made that comment remains relatively calm on through. These Foolish Things would appear on a later album (Just One Of Those Things) as a superb vocal ballad. Cole Capers features a pulsing (tripping?) theme and fun soaring along his fluid phrases in the uptempo stretch between. As mentioned, one of my initial reactions at first listen was a mistaken sense that, excepting a few portions of a couple tracks, it was rather lightly tossed-off. There were other sharply mixed reactions I've also had occasion to reconsider. On the one hand, it was a feast of fantastic piano, non-stop delight at superlative playing. On the other hand there was a wish that there had been a lot more variety. Those familiar with taking in an album by the great Art Tatum might find this a relative breeze by comparison to the marathon streams of thought that may flood through a Tatum set, while others might find this too much to take in a single lump. That depends on each listener. But there was a "sameness" to the tempos and the basic approach which had me hankering for some of the classic Trio programming. With consideration over time and multiple listens, I've come to dispel my qualms. For one thing, the consistency was kind of the point here. Moreover I'd neglected to take in a key factor: while the single, in-depth, consistent and quiet session approach to recording it had been a necessary part of its nature, this set wasn't meant to be played as an uninterrupted stream in the way I had played it. When they recorded these tracks, they expected that the format was only to be 78 rpm records. That entails playing one track and stopping to optionally continue by turning the record over or getting out the next record, cuing it up and then playing it. Deliberately simulating that to some degree by playing track by track at will, I found it easy to take in the whole set without that "sameness" becoming a factor. The distinctiveness of each track was more readily apparent. 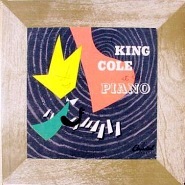 King Cole At The Piano was a boxed set of 10" 78 r.p.m. shellac records at first (evidently released a couple of years after being recorded; I've no idea why), joined a year later by an edition on that newfangled format, the microgroove 33 1/3 rpm vinyl long-play album. The session was recorded on 16" 33 1/3 rpm microgroove discs, monaural of course, which if undamaged, can offer quite satisfying fidelity when played with better examples of more recent gear. However, these initial releases are essentially old disc dubs and can't be considered as offering the best sound possible. That's not to imply that more recent reissues of these tracks offer the best possible sound either. Strangely, 26 years into the CD era I can't think of another complete reissue of it beyond its inclusion as part of the massive Mosaic box set, The Complete Capitol Recordings of the Nat King Cole Trio. It's even managed to miss out in the CD reissue program of his albums by Collector's Choice. The sound quality on the Mosaic set works fine although it's not quite ideal. The source(s) may include an older tape dub with a somewhat thick character, the mono discs were played on a stereo 'table (one track at least wasn't even bridged back to mono) resulting in less than optimal dynamics and it remains a bit uneven in character from track to track. One can discern the shortcomings of the engineering involved and sense the hurry necessary to produce that massive project. Again, at least the sound works well for these recordings. There's always the possibility a newer go will turn out even worse rather than closer to ideal. With no release aspiring to ideal sonically, if one doesn't have the Mosaic set one might be advised to find an original 78 or LP release if possible and if one is so equipped. The original cover is either brilliant kitsch or hideous, but in either case I suspect that it didn't help to move copies at that time (it might get it more attention now though, just for being so... well, let's say different). Enthusiasts may want to know that Nat also recorded a similar set around this time for radio transcriptions which one might call a companion piece. That set was made available on a CD reissue by the Music & Arts label, The MacGregor Years.